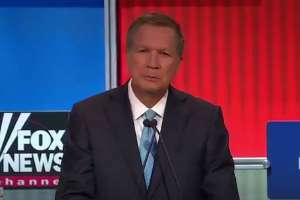 Ohio Governor John Kasich received a warm round of applause in Cleveland Thursday night when he said he would love his daughter is she were gay. During the first Republican presidential debate, Kasich was asked by moderator Megyn Kelly how he would explain his opposition to marriage equality to a son or daughter if she or he were gay. “Look, I'm an old-fashioned person here and I happen to believe in traditional marriage. But I've also said that the court has ruled … and I said we'll accept it,” Kasich answered, referring to the Supreme Court's ruling striking down gay marriage bans in all 50 states. Ohio was among the 13 states directly affected by the court's decision.